Red Wine Poached Pears is a dessert made out of pears poached in sweet red wine, sugar and spices syrup, it originated from a French dessert called Poire belle Hélène which is a nearly similar dessert where pears are poached in sugar syrup served with vanilla ice cream, chocolate syrup and crystallized violets. The dish was created during the 1860’s by Auguste Escoffier and was named after the operetta La belle Hélène by Jacques Offenbach. A really simple yet an elegant desert, it is sweet but not overpowering, it is fruity with hints of red wine and its really great after a very tasty meal as it give you that clean fresh flavours that lasts. A truly decadent dish that you should try! Pour lemon juice all over bosc pears then set aside. In a small sauce pan combine red wine, white sugar, vanilla bean and cinnamon stick. Bring it to a boil then add the pears. Simmer for 12-15 minutes on one side then further 12-15 minutes on the other side. Remove pears from sauce pan then set it aside to cool. Simmer the left over syrup until they are reduced in half the amount, pour sauce over pears serve warm or chilled (I want mine chilled). 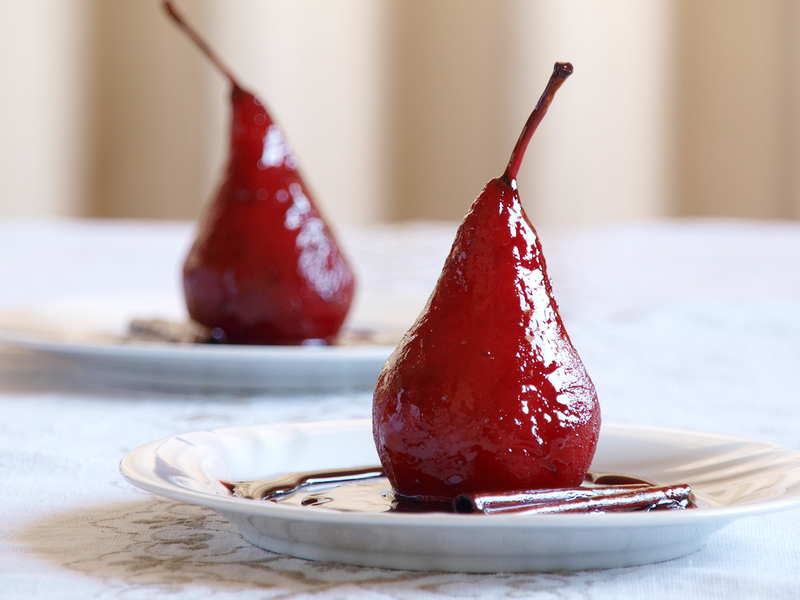 I love pears in red wine and yours look absolutely perfect! I usually serve mine with double cream. Oh, this looks like a winner for a dinner with friends! Very classy! WOW, those are truly stunning!!! What a showstopper. Great looking dessert that I’m all about. Toss those pears in some Zin and delish! I just discovered poached pears and they are delicious! That photograph is stunning. Takes my breath away! The pear looks fabulous! Great for cleaning taste buds especially after eating strong taste of flavours! wow..it is a tasty delight..great post..! I’ve always meant to do this but never have. I almost think they look like little hershey’s kisses dyed red! No problems with the alcohol content as it will be gone due to the cooking process so all you enjoy are the flavours of grapes. Amazing and love the pics so badly. Love the gorgeous bright red! Breathtaking photo Raymund, and a simple yet sophisticated dessert. Very chic indeed. I adore poached pears! I’ve only used juice / sugar … duh! of course I should try wine! Thanks for the recipe!